Mom's homemade cinnamon rolls were the hit of Saturday baking day. A real comfort food for Sunday morning breakfast. Mom would roll out the dough and sprinkle with cinnamon and sugar mixture, then it was my job to sprinkle the raisins. Mom would roll it up and cut into slices. The house would be filled with the sweet aroma of baking cinnamon and sugar. The helper got a little special treat after all the work was done. 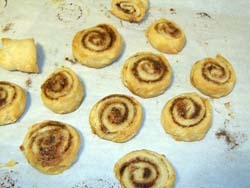 A little piece dough rolled flat and sprinkled with cinnamon and sugar, then baked flat in a pie pan until crispy brown. In a large bowl mix milk, sugar, melted butter, salt and egg. Add 2 cups of flour and mix until smooth. Add yeast mixture. Mix in remaining flour until dough is easy to handle. Knead dough on lightly floured surface for 5 to 10 minutes. Place in well-greased bowl, cover and let rise until doubled in size, usually 1 to 1 1/2 hours. When doubled in size, punch down dough. Roll out on a floured surface into about a 15x9 inch rectangle. Spread melted butter all over dough. Mix sugar and cinnamon, sprinkle evenly over buttered dough. Sprinkle with raisins. Roll dough starting with the longer side. Once completely rolled into a tube shape, roll tube over some sugar to coat the outside. Cut into 3/4 to 1 inch slices. You should get about 15 slices. Coat the bottom of baking pan with butter and sprinkle with sugar. 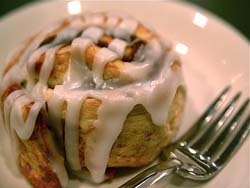 Place cinnamon roll slices fairly close together in the pan and let rise until dough is doubled, about 45 minutes. Preheat oven to 350 degrees. Bake for about 30 minutes or until nicely browned. While the rolls are cooling make the glaze. Mix the butter, powdered sugar, and vanilla. Add hot water 1 tablespoon at a time until the glaze reaches desired consistency. Spread or drizzle over slightly warm rolls.